Yes, Oktoberfest season is here—we’re not sure when exactly, but fans of polkas and pork products have plenty of time to partake when it best suits them. The official starting date of this particular sausage party is September 17 in Munich, where it stretches leisurely all the way to October 3. Sadly, here in the states we are not encouraged to roister drunkenly in the streets for just over a fortnight like our Bavarian brethren, but somehow we make do with a few precious weekends. Zenner’s Oktoberfest at Oaks Park It’s three days (Sept 23–25) of suds, songs, and celebration at Portland’s most resilient amusement park. In addition to chicken dancing and tuba tunes, the festivities will include wiener dog races, pretzel tossing, and a bear-hug race, activities that are considered far too weird for non-Oktoberfest merriment. At least a dozen vendors of food and drink will be on the premises, along with a whole battalion of craftsmen hoping to beguile intoxicated revelers with facial art and scented candles. Der Rheinlander Oktoberfest As one would expect of Portland’s longest-running bierhaus, there will be an assortment of amusements on tap this weekend. Those blessed with a sturdy appetite (and elastic waistbands) may want to test their mettle in the pretzel and sausage-eating contests. In order to get the heart beating again, dancing to Chicago polka band Paloma is strongly suggested. A portion of proceeds will benefit Northwest Down Syndrome Association, so bring friends. There’s also a costume contest if you think you’ve got the legs for it. 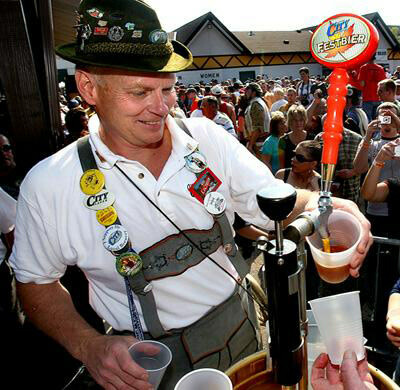 Prost Oktoberfest The Mississippi Avenue headquarters of German-style merrymaking will be joining in the fun Oct 1–2, with a 5,000 square-foot beer garden, live music, food carts, and chicken barbecue. Prost’s first-ever masskrugstemmen competition will take place at 3 and 8 on Saturday, a contest that requires participants to hold a one-liter mug full of beer at arm’s length for as long as they possibly can. Prost also is home to the two-liter glass boot, a vessel which when filled with Paulaner or Hofbrau should provide the impetus for spirited chugging followed by some impromptu drinking songs, and the ceremonial summoning of the taxi. Occidental Brewing at Cathedral Park Place New brewers on the block Occidental Brewing in St Johns will unveil their Festbier 2011, a special Oktoberfest autumn warmer that should serve as an appropriate and tasty introduction to Occidental’s impressive roster of Bavarian-inspired ales. Gypsy dance band Chervona will keep things moving as attractive citizens attired in lederhosen and dirndls spin and stomp gracefully. Traditional German foodstuffs will be provided by Cathedral Park Kitchen.